or £3.50 each when purchased with a die-cast plane. 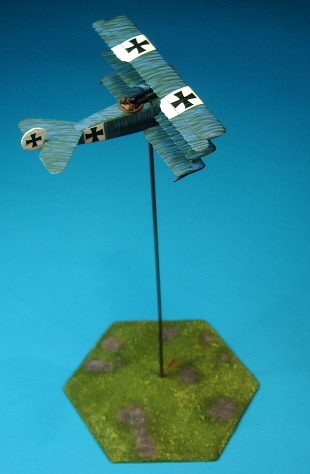 Flying stand designed for use with 1:72 plastic WWI or similar size and weight aircraft models such as die-cast 1:100.
a brass tube 2mm dia. x 225mm long that is a push fit into the base, but not fitted for shipping. Hex shape flying stand base , 150mm across the flats x 10 mm thick at centre and tapering the the edges. 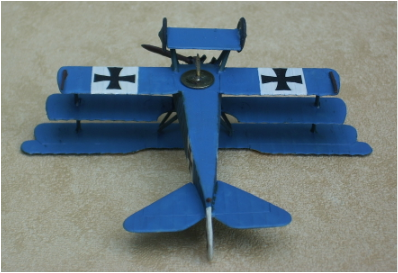 Airfix Fokker triplane not included in the sale of stand or bases. A supplied standard drawing pin fits into the 2mm brass tube and pivots freely. Many WWI planes have a flat bottom to the fuselage and and for lightweight planes double sided tape is adequate to attach the head of the drawing pin which has been hammered flat first. A round bottom fuselage will require the drawing pin head to be shaped to suit. All models and images are copyright Tiger Terrain 2014 - 2019.